In a most loving, pleasant way, I have been nagging — er, suggesting to Bill that he should get his hair cut. He finally did yesterday, going to a barber not too far from our house. When he got home, he told me that there were very many gun magazines to look through while waiting to get a haircut. That’s why he wasn’t surprised when his barber pulled back his white barber’s coat and showed him that he was, in fact, wearing a holster containing a pistol. In fact, it seems both barbers were packing heat. “I guess that barber shop won’t get robbed,” Bill said. I agreed, though he and I both acknowledged that it would seem to us that barber shops are not the first businesses to get robbed. 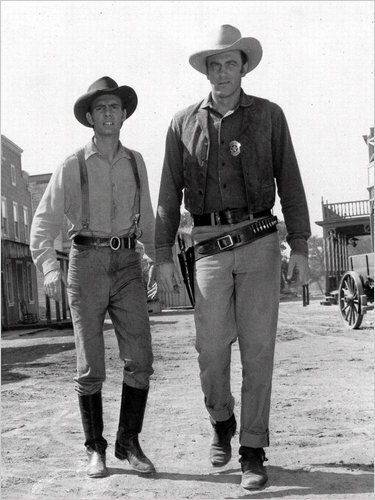 Marshall Matt Dillon and his sidekick Chester packing heat and perhaps going to the barber in Dodge City. You might call these barbers First Responders. They meet all your security and hair needs.